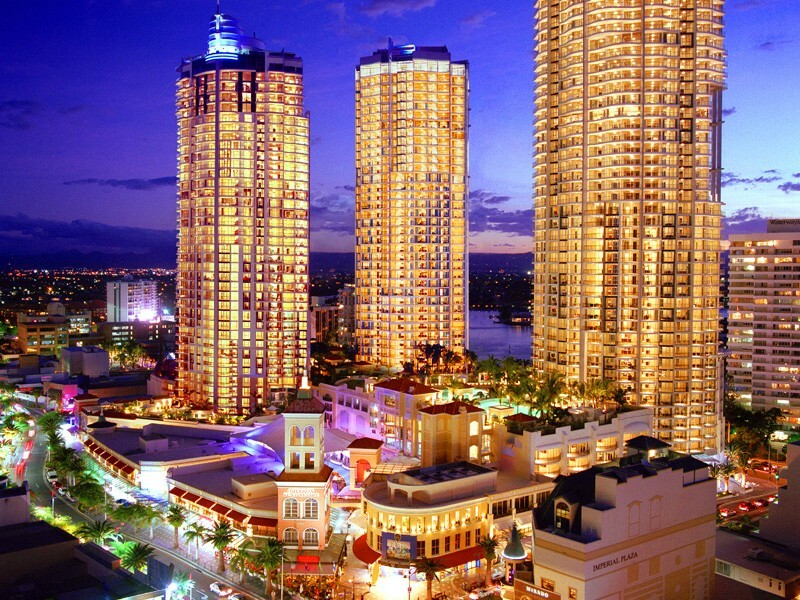 A Gold Coast icon, Mantra Towers of Chevron famously stands in the heart of Surfers Paradise, and is known for its three majestic towers reaching for the heavens. Chevron’s fame equates to that of Meter Maids, Q1, and Cavill Mall, in fact it is almost as if the building was birthed along with the trademark golden sand beaches. As well as its iconic fame, Mantra Towers of Chevron is a popular resort among locals and visitors alike due to its exceptional location and surroundings. Within walking distance lie an abundance of activities and attractions; get creeped-out at Dracula’s Haunted House, adventure through the psychedelic Infinity, try your hand at tenpin bowling (with a bar handy), see the world* from Sky Point Observation Deck (*world may be hyperbole for Gold Coast), tour land and sea on an Aqua Duck adventure or take a traditional cruise, test your eyes at the Wax Museum, decide whether you believe it or not at Ripley’s Museum, or wander through the beachfront markets on the Surfers Paradise foreshore. Boredom will be a thing of the past! There are endless ways to amuse one’s self when staying at Chevron, as well as activities and attractions there is a plethora of fantastic shopping starting with the centre underneath the resort including haute couture, boutique alcoves, and quaint bargain stores so you can browse through new looks, grab that new bikini, or pick out a nice outfit for dinner. The resort is a short 400 metre stroll to picturesque beaches that boast 300 perfect days a year with pounding sapphire surf and vigilant life guards, however if you want a calmer, yet equally as magical water experience, don’t bother leaving Chevron. 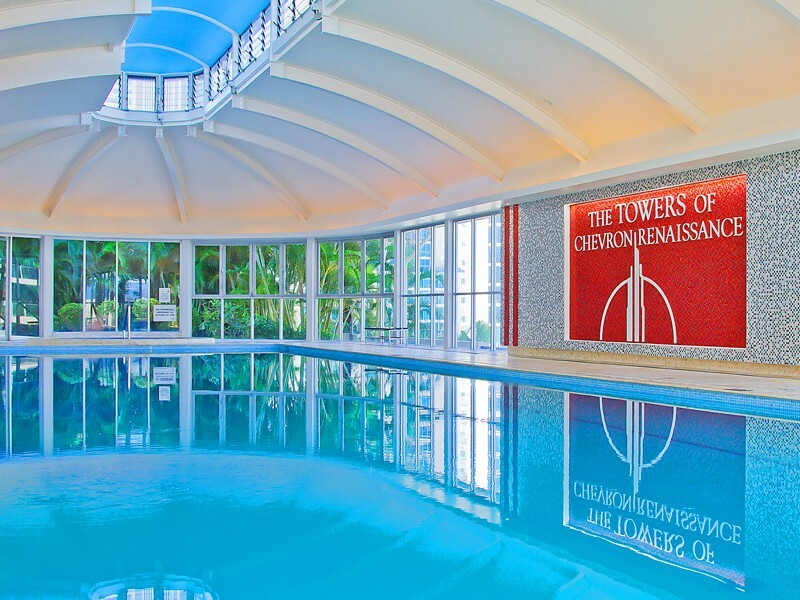 The crème de la crème of Surfers Paradise pools, lagoons, and spas can be found on level 5; as the elevators open the expansive 1.25 acres of “Beaches in the Sky” is revealed. The beautifully manicured recreation area is dotted with tropical gardens that fringe the 600 square metre lagoon pool complete with spas, bridges, and white sand beaches. There are three main pool areas, the lagoon pool, indoor heated pool, and standard outdoor pool – our DQ hot tip is to seek out the second outdoor pool if you are holidaying without children and are looking for a child-free, relaxing environment. Beaches in the Sky is also equipped with barbeque and entertainment areas galore! You will find these private gems peppered throughout the recreational space so guests can enjoy a barbeque meal with their slice of tropical lagoon bliss. The lavish gardens that surround the resort provide a barrier and add a level of privacy to these areas for you to enjoy with your family or friends. Also on level 5 is the health centre that boasts a 25 metre indoor heated pool, female and male saunas, and indoor spa for the cooler months (relaxation is equally important in winter) and for the fitness fanatics there is a fully equipped gym open between 6am to 10pm to get your sweat on. As you enter the indoor area there is even a handy vending machine boasting everything from swimming nappies and sunscreen to healthy snacks and Gatorade. 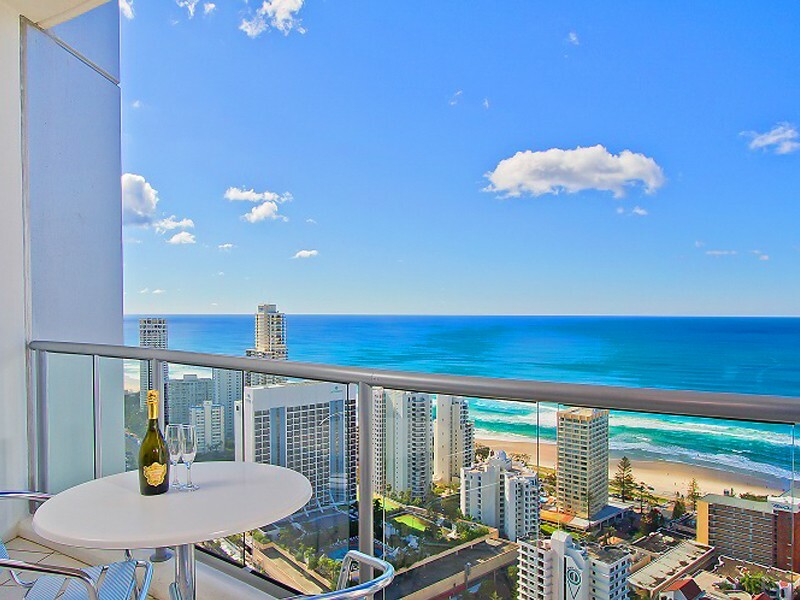 As one of the top Surfers Paradise accommodation providers offering 4 star self-rated luxury, rooms at Chevron range from studios, to 1, 2, and 3 bedroom layouts to sub penthouses, and penthouses. All apartments feature laundry and dryers, full gourmet kitchens, air conditioning, complimentary cable TV, modern furnishings, and balcony with scenic views of either the Pacific Ocean to the Nerang River, or the Gold Coast Hinterland. No matter which room you select, your apartments has been decorated and designed to create the perfect Surfers Paradise holiday. Mantra Towers of Chevron is highly popular among families due to the convenience of the location, the ability to prepare meals in the full gourmet kitchen, and the Coles grocery store, bottle shop, chemist, and shopping available once you stop at ground level. There are also numerous dining options nearby from cafés and take away options to alfresco dining to 5 star restaurants, Surfers Paradise cuisine is at your mercy! Nosh Pan Asian located in the nearby Mantra on View Hotel, and we cannot recommend their buffet breakfast enough! It's absolutely amazing, mixed in with the traditional brekkie items, you'll find items laced with Asian inspiration. You will also certainly be full past lunch after indulging in this buffet. 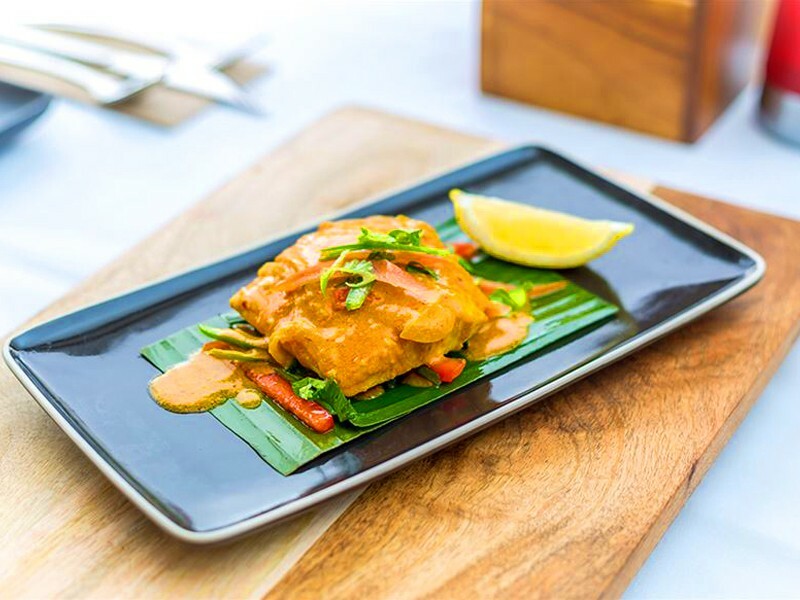 Koastal Kitchen is a Surfers Paradise favourite boasting contemporary cuisine favouring simple and fresh flavours and a family friendly atmosphere. Northcliffe Surf Club is another family favourite, providing excellent service, a lively child-friendly atmosphere, panoramic views over the Gold Coast’s most famed beaches, and a well-curated and diverse menu that offers gluten-free and vegetarian options. To top off your holiday there is even a private theatre in the resort that seats up to 18 people who can enjoy an air conditioned cinema experience at their leisure! There are kitchen facilities in the theatre so guests can enjoy snacks and drinks throughout their movie marathon. This is a great spot for rainy days or for a casual afternoon in. Bookings for this facility can be made at reception. One of the most prominent benefits to Discover Queensland guests is the central location and access to transport. Our customers loved being able to zip around the coast easily with both a bus and tram stop across the road from the resort making theme parks, shopping, airport transfers, and adventuring around the Gold Coast simple and affordable. - Upgrade to a room on a higher level – the views are worth it! - Complimentary parking for those driving to Surfers is a HUGE bonus - so take advantage. - Make use of the kitchen facilities and the grocery store downstairs. With one of the Gold Coast’s best lagoon pools and recreational areas (how can you beat a whopping 1.25 acres in the middle of Surfers? ), proximity to transport, cuisine, attractions, and the world famous Surfers Paradise beach this resort comes with an impressive resume. The experts at Discover Queensland proudly work alongside Chevron to provide guests with the best service and most affordable prices, so speak to the team today on 1300 788 553 to book your next Surfers Paradise foray!